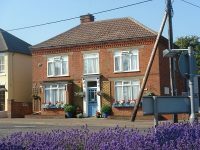 A large detached property set in mature gardens and situated just off the Norwich outer ring road. The public rooms include a large open-plan lounge and breakfast room with a TV and sofas. The well-equipped bedrooms are smartly decorated and have matching soft furnishings.